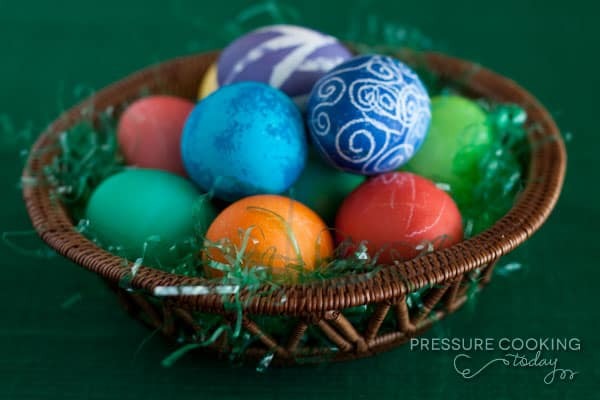 This Easter you should cook your hard boiled eggs in your pressure cooker. It’s the best way to cook hard boiled eggs. It’s quick, easy, your eggs will be perfectly cooked, and amazingly easy to peel. 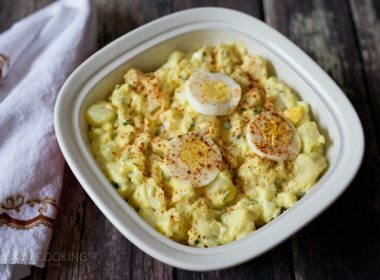 If you haven’t tried cooking hard boiled eggs in the pressure cooker, you’ve been missing out. Laura, Hip Pressure Cooking, and Heather, Healthy Family Cookin, turned me on to cooking eggs in the pressure cooker and I haven’t cooked them any other way since. Today I’m sharing an updated version of how to cook Hard Boiled Eggs for Easter in the Pressure Cooker, or any time of year. 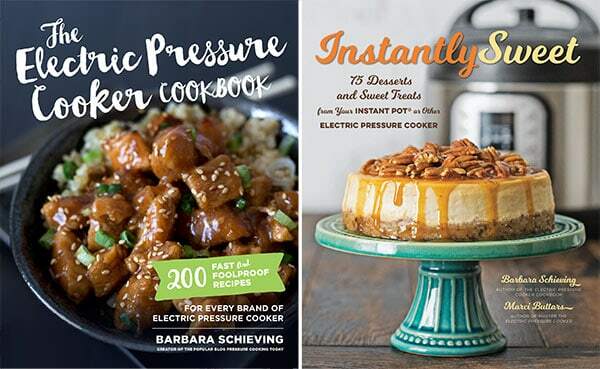 An Instant Pot is one of the most popular brands of electric pressure cookers. They are easy to use and your Instant Pot can help you create these delicious Hard Boiled Eggs for Easter! I like to use my steamer basket, the OXO Good Grips Pop-Up Steamer. It makes removing the eggs from the pressure cooking pot easy. If you don’t have a steamer basket, you can use the rack or trivet that came with your pressure cooker. If you don’t have a rack, they’re inexpensive to buy and a must have with a pressure cooker. I only cooked 8 eggs, but if you want to cook more, the handle is removable and you could put more in the center. 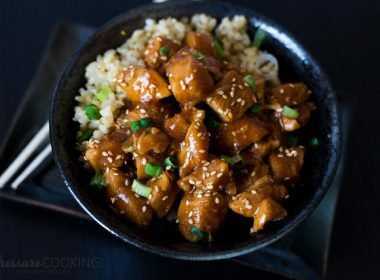 It took 6 minutes for my electric pressure cooker to reach high pressure, a 6 minutes cook time, and another 6 minutes for a natural pressure release. I just pressed the start button and walked away until the timer beeped. It couldn’t be more simple. 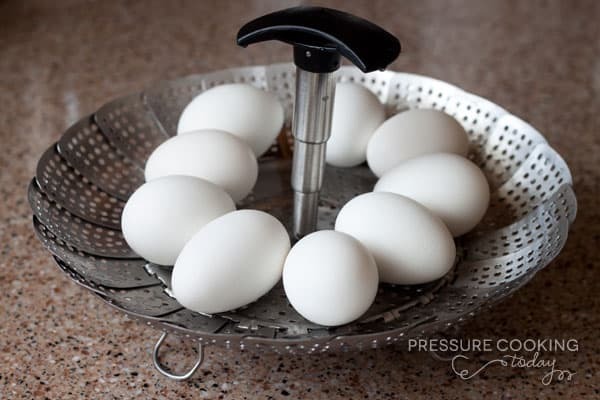 When the pressure has released, remove the steamer basket/eggs from the pressure cooker and plunge the basket into ice cold water to stop the cooking. There’s a lot of discussion about cooking perfect hard boiled eggs on the Instant Pot Facebook Community Group. While 6 minutes on high pressure with a 6 minute natural release works for most people, everyone likes their eggs a little bit different. 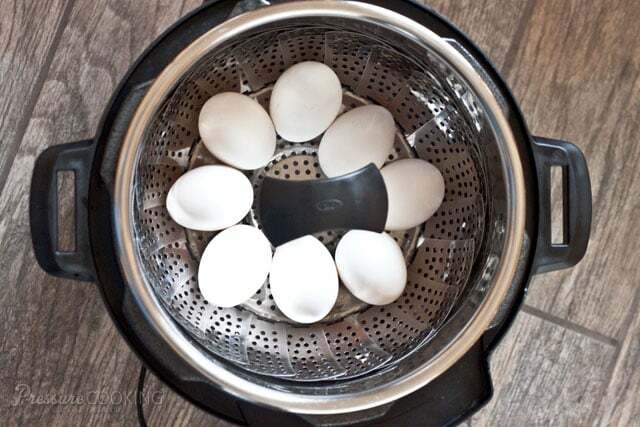 Timing could vary based on the size of your eggs, what material your steamer basket is made of, etc. If it’s your first time hard boiling eggs in the pressure, you may want to just cook 1 egg until you find out the sweet spot for you. Once the eggs are cooled, remove the eggs from the cold water and refrigerate until you’re ready to color your eggs for Easter. If you’d like ideas for decorating your eggs, here’s a guide for dying your eggs, and I saw lots of fun, creative ideas on Pinterest. My daughter was the creative genius behind our eggs. She was having so much fun coloring them that we decided to quickly cook up another batch and color more. 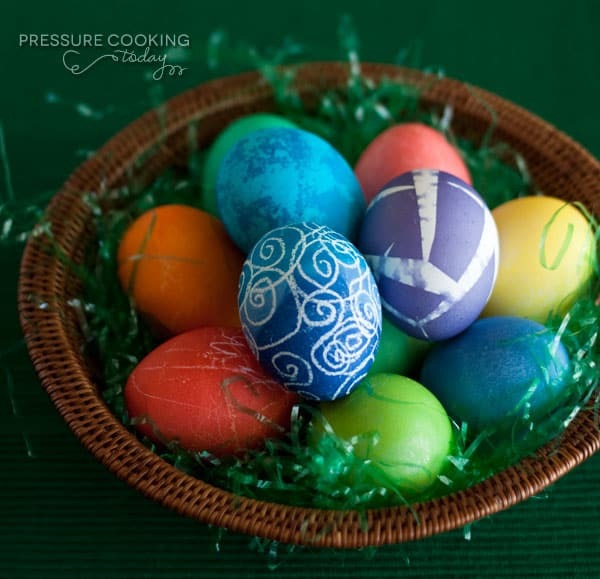 For more Easter pressure cooker recipes,including my quick, old-fashioned potato salad recipe and details on how you can “bake” your Easter ham in the pressure cooker, visit my Easter Pressure Cooker Recipes roundup. 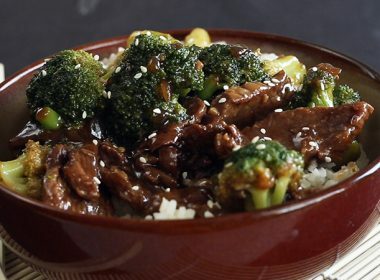 Put a steamer basket* in the pressure cooker pot. Add the water and the eggs. Lock lid in place, cook on High Pressure for 6 minutes. 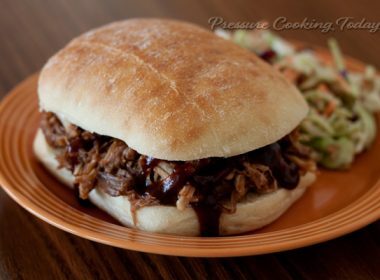 When you say high pressure do you mean like the canning setting on my pressure cooker xl . Which i think is the highest. Or any other setting for 6 min. I’m late to the convo- but I thought I’d share this gem I stumbled into by chance- the last time I used the IP for hard boiled eggs the eggs that were stacked on one another seemed to all crack, dont know if it is the vibration or what but, I recently purchased silicone muffin cup liners. You saw the light bulb come on- right. I used the short rack insert that came with the IP and placed the eggs in the silicone liners. 8 fit on the bottom and 4 more in liner cups directly on top of the original 8 – perfection! easy peel no cracked eggs. I used a slotted spoon to scoop the eggs out of the liners, hot water had gathered in the cups- be careful. Thanks for sharing your tip Jackwelyn! After just attempting three different times in my instant pot to boil eggs for Easter egg dyeing, I have 9 out of 27 that completely cracked, so although I can eat them, we can’t dye them. I think I’ll stick to the old fashioned way to boil for egg dyeing unless there is a trick to this that I don’t know about. 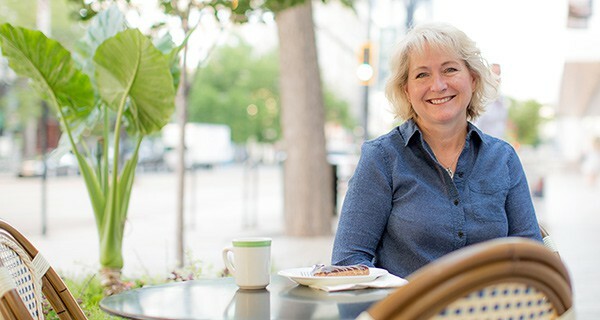 Hi Rachel – my experience has been if they crack in the pressure cooker, they probably would have cracked boiling on the stove. Some eggs have hairline cracks that you don’t notice. Is there any need to prick the shell on the air bubble side like I ususally do when boiling eggs? I wondered it that would make the pressure cooking better or worse. I’ve never tried that. You could experiment and let me know. For cooking eggs for easter egg dying, do we need to add vinegar to the water to prep shells for t he dye? Used to years ago. Hi Barbara – since the eggs steam and aren’t in the water, I don’t think adding vinegar would help. I haven’t found it necessary. Have fun! 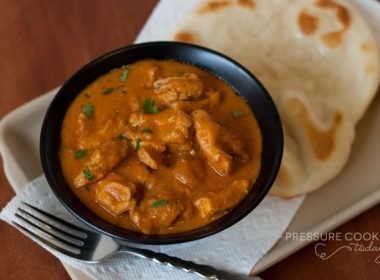 How much water do you put in the pressure cooker? Amazing! I was skeptical that the eggs would be easy to peel….I’ve tried many things that were not successful. However, the shells came off perfectly!!! I will never boil eggs any other way. Thank you so much! It really is amazing. Thanks Julie!